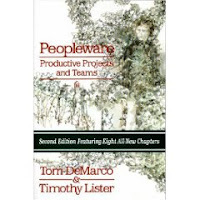 Peopleware:Productive Projects and Teams by Tom DeMarco and Timothy Lister. Like any other Software Engineering bible, the book is present everywhere: as reference in a large number of technical books, as reference in various articles, mentioned by fellow programmers and project managers, with fragments quoted in blogs and read in group readings, everywhere! 'Teamicide' did it! For me, it was the drop that filled the glass: another term from the quoted book that well describe acts I see around me. Next week I had the book in my hands. The book came at the right time: after being part of a large variety of teams, after the PMI Project Management course, after the CMMI training, after seeing the "Scrum" steps my corporation takes towards Agile adoption. More about growing super productive teams and teamicide: what glues the team, what can destroy it? More about project management, DeMarco & Lister's views on software engineering and project management. Learn is not a good word here, realize - works better. 1. Realized why I disliked sets of measures that I saw put in place in the environments I was part of. Defensive management measure set: mistrust, the Big M. Methodology, Laetrile. 2. Without any study in process control theory, DeMarco and Lister reach the same set of conclusions as Schwaber and Beedle: the management of indeterministic processes through Big M. Methodologies is doomed to fail. Excellent examples and comparations in this book: work-to-rule australian strike analogies, etc. 3. Realized why my former manager seemed to me so lucky. Having a strong team knowing what to do, with good moral and good accomplishments, feeling superior to the neighboring "regular" teams, the best of the best, was not an accident. His "Open Kimono" management approach, together with his active involvement in recruitment and contract negotiation phases - simply gave the right results: a super-productive team! The general perception though was that he did nothing, all the good things just came on - sad but true! 4. Coding Wars: their scope and success criterias. I want to organize a session in my current company : if a fishing contest can be organized by my company, why not a coding one!. Tested the waters around here and it seems that a lot of people are interested in the topic - maybe after hollidays (Octomber) - we will run the first coding marathon in Eastern Europe! 5. Hawthorn Effect: give your team small potatoes to play with, challange them, celebrate with them, life is prety boring otherwise. Did I also mention that their productivity will reach the sky?! No, I'm not creating another Laetrile - there are good chances that the productivity will raise a little, but the important aspect is that the fun is guaranteed. 6. We are not working on High Tech Projects, we are not working on High Tech Projects, we are not working High Tech at all: all our problems are sociological in nature! Will I remember this?! It's good to have this book read at that moment. You might not be aware of your mistakes at that time! If you are annoyed by a set of measures you see in your envronment and you don't know why, try to find the explanation here! You might find here a Plain English explanation and at least you'll know why you are upset! If you think that nothing can be done in your case or your organization, that death is comming, use this book as a shoulder to cry on or as an ally to change the world! Hmmm, the good Summary - after re-reading the book. The first read was just drink from firehose!